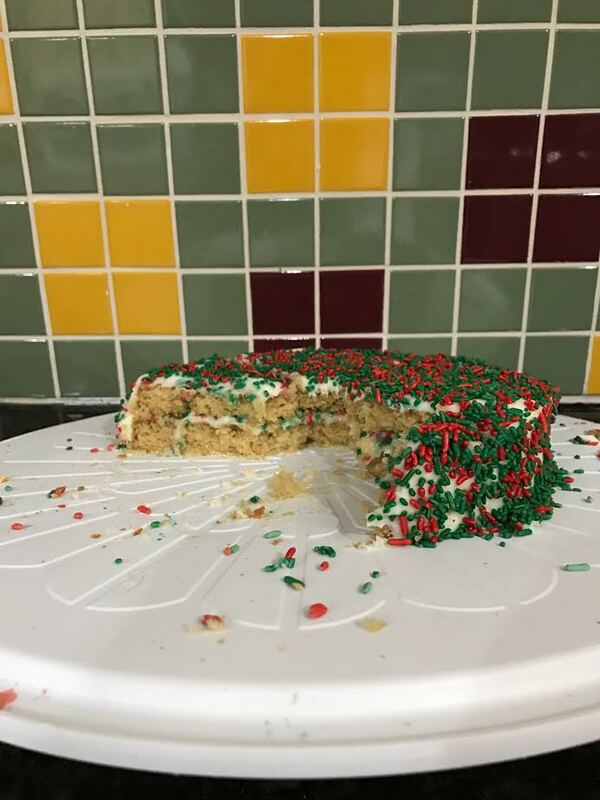 This time the lesson began with a picture of a festive layer cake I saw on line. It was stunningly beautiful and I knew the moment I saw it that I wanted to make it and bring it to my sister’s house for Christmas. It was at least a foot tall and consisted of multiple layers (more than two) of snowy white cake and icing with flecks of red and green inside the cake (creating a tie-dye effect), and a dusting of the same red and green bursts of color between the layers, on the sides and on top of it. It would be a show stopper! The ingredients were pretty basic and I knew I could easily alter the recipe to make the cake vegan. 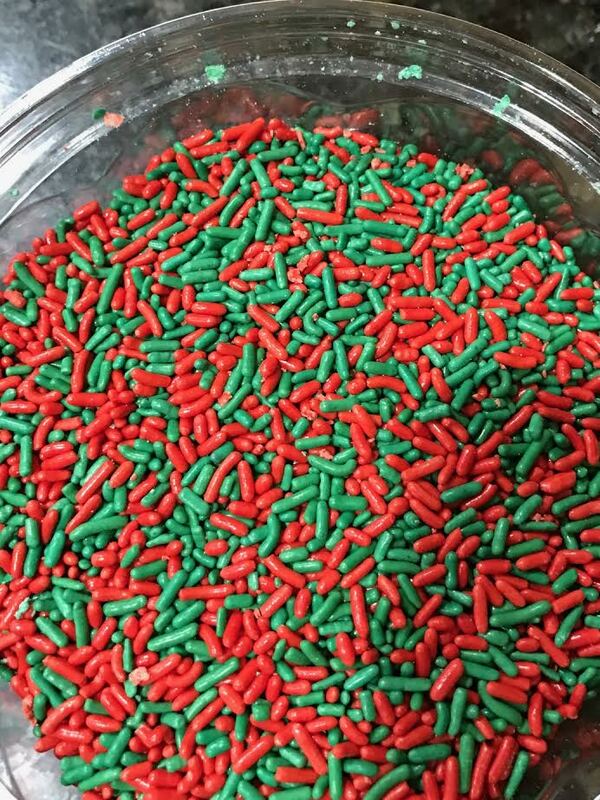 The most challenging thing to find was the container of red and green “jimmies,” as I call them, or “sprinkles,” as you may know them. After searching the entire supermarket in town for this pivotal ingredient with my daughter, we spotted the lone container of red and green jimmies in the last aisle on top of the ice cream freezer. Desperate to get the goods, we both lunged for the container as if there were others competing for it, and then laughed to each other about our silliness, since we were the only ones in that competition. We were satisfied with our “win” just the same and knew that no one could have rivaled our split second timing in making the jimmies our own and putting them in our shopping cart! My mind wandered while we were waiting for the movie to start and I was relieved that I remembered to bake the layers for my holiday masterpiece earlier so I could ice it the next day when it was completely cooled. I felt happy that I was with my family of four as we continued a relatively new Christmas Eve tradition of going to the movies and out to dinner. My relief quickly changed to regret as I realized that I had forgotten to add the red and green jimmies to the batter! Just as quickly, I was back in my happy place again, seeing the humor in the whole cake thing. It was only a cake and it would still look and taste great. The next day (Christmas), right before we left for my sister’s, I was ready to assemble “The Masterpiece.” After I put some icing between the two layers, I iced the sides and then the top of the cake. Just as I was about done, my daughter walked into the kitchen and asked why I hadn’t added the second layer of cake before I completely iced it. I informed her that I HAD added the second layer and we both laughed at how flat the cake was, in comparison to our muse. * I hadn’t considered that the vegan recipe might limit the cake’s height and it looked lost on its large palette. When we covered it in red and green jimmies, it looked festive, and I was certain it would taste great. We had a wonderful time at my sister’s and the cake looked and tasted fine. Even though it was drastically different from what my daughter and I had imagined, it was so much more. When my daughter thought back to the new Christmas memories we made this year she commented that lunging for those jimmies together in the supermarket with me would be one of her fondest. Be brave, be kind, take risks, stay curious, embrace change, keep striving to make what’s in your heart and what’s in your head a reality, have self-compassion when you fall short of your goals, and know when to ask for help. *If you want a good laugh, just search google images for “green tie dye cake” and you will see what my inspiration was for my holiday cake, and how much I fell short (but not really).